Japanese mobile phones are very hit and miss – some have fantastic (mostly network-related) services, yet are ugly as sin, while others look great but offer very little else. Now, however, a new category is becoming apparent, as the number of simple-to-use handsets from major manufacturers is increasing, while included functions aimed at their elderly users become more useful than the music and video players found on normal models. A perfect example is the new F884iES, a mobile made by Fujitsu for market-leader NTT DoCoMo's Raku Raku (Easy Peasy) range of phones for OAPs. 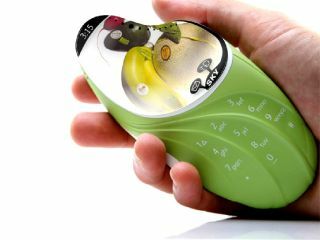 The new handset creates a daily health diary for its owner by combining information gathered from two sources built into the phone. A pedometer measures how far the user walks each day – the Japanese government recommends 10,000 paces daily for retired people, who can often be seen clutching dedicated pedometers in the street, incidentally – and adds it to data from an ingenious bit of camera trickery. The phone's camera can be used to measure blood flow in a fingertip pressed to the lens, which translates into an accurate heart-rate reading. Together, the data are graphed over time, providing a useful, yet simple, tool that could easily be shown to a health professional at a check-up or after a problem has arisen.